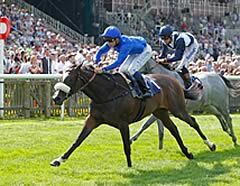 Certify provided Godolphin with their third consecutive success in the Group One Shadwell Fillies’ Mile as the daughter of Elusive Quality forged clear under Mickael Barzalona. White Moonstone and Lyric Of Light have taken the mile event for the previous two years, but neither matched the style and panache of Certify’s success. The filly was backed in to 4/6 favouritism and was held up in rear by her young French jockey, before being given the office inside the final two furlongs and she easily drew away to beat Roz by four and a half lengths. Certify signs off 2012 unbeaten in four runs and now heads the QIPCO 1000 Guineas betting with Coral at 8/1, having been 14s prior to her success over the Classic’s course and distance. Trainer Mahmood Al Zarooni said: “She was a bit excited before the race and that is not normal for her. It is her fourth run of the year and I would prefer to put her away for next season. “I asked Mickael what he thought and he said she was excited and to put her away. I will have to talk to His Highness and I think it is likely we will put her away - she is a lady we should look after. “She was still a little green at Doncaster last time and she was in front a long time today and I think was still a little green. “Lyric Of Light won this race last year but I think that this filly has won the race better than she did. I cannot say 100% definitely that she is better than Lyric Of Light but she has won by over four lengths and Lyric Of Light only won by a head. “There are a lot of good two-year-olds who are not good three-year-olds but I hope she is not one of those. Barzalona said: “When you have a good horse, it makes it easier. She is a very nice filly - she has improved after each race and I hope that she can improve again from this. “She was a little bit keen and hung a little bit today but, when I asked her to go, she answered. She is very straightforward and kept going. Godolphin’s racing manager, Simon Crisford, added: “That was a fantastic performance and she has won very well. The result was never in doubt. “From her first win she has always looked very exciting, and when she beat that smart filly (Sky Lantern) who went on to win a Group One in Ireland, she showed her prowess as a leading juvenile. Roz, trained in Lambourn by Harry Dunlop, came a distant four-and-a-half-length second to Certify in the Group One Shadwell Fillies’ Mile but nonetheless delighted her trainer. The Teofilo filly has only had four runs in her lifetime and this second comes on the back of victories in a Listed at Sandown and a maiden at Kempton with a disappointing first time out last of eleven now a distant memory. Dunlop said after the race: “Second in a Group One on the back of a Listed victory - I am thrilled. 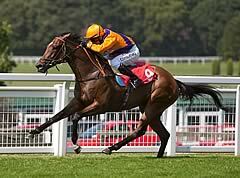 I just felt we had to take our chances with Certify and I am absolutely thrilled with her run. Jim Crowley, who partnered Roz, said: “I thought Roz ran a super race. She has improved since her last run at Sandown and I think there is more to come - she will be a better filly next year. "It will be interesting to see what route she takes next year as there is a possibility she will get further but we will learn more after the trials." Frankie Dettori, who was on board third home Amazonas for trainer Ed Dunlop, said: "We rode Amazonas to get placed so it’s mission accomplished."